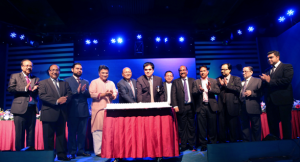 The Premier Bank Limited celebrated its 16 (Sixteen) years Anniversary at Ball Room, Pan Pacific Sonargaon Hotel, Dhaka on 19th November, 2015 (Thursday). In order to make the program memorable and colorful, Premier Bank arranged a Cake Cutting program with the patrons and employees of the Bank to celebrate 16 years of success. Premier Bank launched a new value proposition named “Premier Direct” where customer will get services such as Internet Banking, e-Statement, SMS Alert & new Corporate Website etc. Mr. Tofail Ahmed, MP & Honorable Minister of Commerce, Peoples Republic of Bangladesh was present as Chief Guest. Honorable Mayor of Dhaka North City Corporation, Mr. Annisul Huq, Deputy Governor of Bangladesh Bank Mr. S.K. Sur Chowdhury, FBCCI President, Mr. Abdul Matlub Ahmad and Honorable Chairman of The Premier Bank Limited Dr. H.B .M. Iqbal were present as special guests. Among others, Vice Chairman of Bank, Mr. Mohammed Imran Iqbal, Honorable Directors of the Bank: Mr. B. H. Haroon MP, Mr. Abdus Salam Murshedy, Shah Mohammad Nahyan Haroon, Managing Director & CEO Mr. Khondker Fazle Rashid, Advisor Mr. Md. Ehsan Khasru, Senior Management and employees of Head Office were present in this auspicious occasion.